We don’t just operate warehouses. We order, organize, track and distribute the lubricants that keep companies in business, and get people where they need to go. At our Bulk Plants we help secure orders, take care of inventory, and organize the warehouse so we are ready for those orders when they come in. Our Team Members are effective due to their excellent communication and dedication to the company. 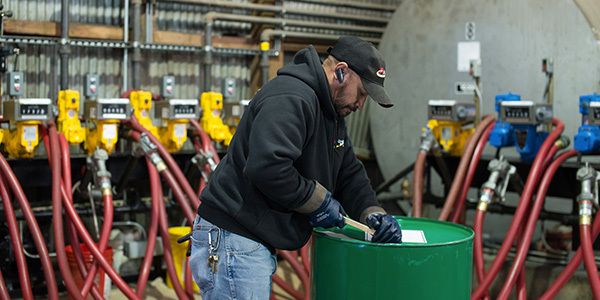 We are the fastest growing lubricants distributor on the west coast, getting to work in a Flyers bulk plant is simply energizing. For those who get to join the team, you were picked with good reason… Show the team what you’ve got and you won’t go unnoticed! I don’t believe there is a better company to work for. This company really cares and it shows. I love that this isn’t just a family business, it’s a friendly family business. Flyers truly appreciate their team members and are constantly trying to improve.